Designed for more than just work, the Evolve 75e Wireless Earbuds from Jabra features many helpful functions for most users. For communication, it features a three-microphone design to ensure that you're heard while also filtering out outside noises. 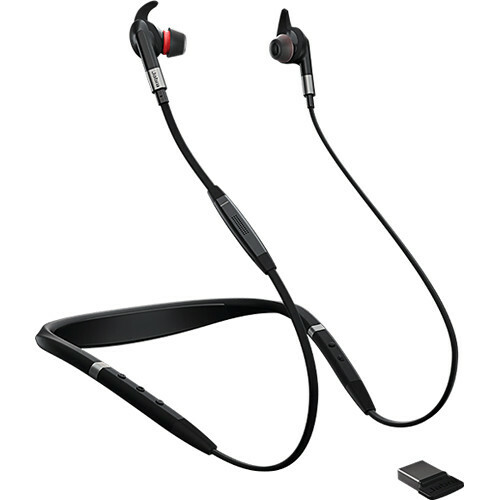 Additionally, it provides you with both passive and active noise cancellation, allowing you to hear clearly. An integrated "busylight" lets others know when you don't want to be disturbed. Located on the neckband are five buttons for quick controls of calls and music, and built-in vibration provides you with silent notifications. Included are a pack of EarGel and EarWings for multiple fitting options. The models that are certified for Microsoft Skype for Business (Lync), support Microsoft Skype for Business in Plug and Play mode. These models support features to answer and end calls, adjust volume, and mute. If you are not using Microsoft Skype for Business, use the standard UC model. Box Dimensions (LxWxH) 7.3 x 6.9 x 2.1"
is there an electronic hook switch (EHS) for the 75e to use with a (Panasonic KX-DT546) desk phone?